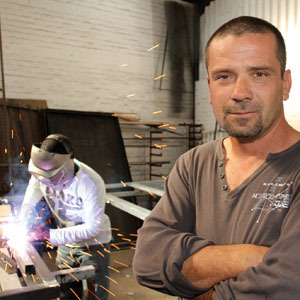 Welders are tradespeople who specialise in fabricating products by joining together materials like steel, brass, stainless steel and aluminum. They cut, shape and join sections of metal in a wide range of industries, such as automobile manufacturing, ship building, construction and the creative arts. They also carry out repairs on manufacturing equipment and machinery. They may perform manual welding, in which the work is entirely controlled by the welder, or semi-automatic welding, in which the welder uses machinery, such as a wire feeder, to perform welding tasks. The work of a welder includes: selecting and laying out materials to be cut or joined; following engineering instructions and drawings; using the most suitable welding method for the job at hand; inspecting and testing cuts and joins, using precision measuring instruments such as a micrometre; operating semi-automatic spot-welding equipment (often found on high volume production lines like car manufacturing). Why did you choose to become a welder? I had little choice. I grew up on a small island in the Adriatic that had very few industries, and I didn’t like school very much. My dad was a welder and I used to help him from time to time when I was a teenager. I was never taught how to run a business – I had to learn that myself. What training did you undergo? I did a welding course at the shipyard in my home town. Is there a type of personality best suited to this work? Someone who likes to be hands-on and who wants to try to make something on his own. Someone who is outgoing and creative, has stamina and a good eye for detail. How important is experience? Formal training teaches you the basics, experience teaches you everything else. Learning never stops. Describe a typical day on the job Usually I meet my workers at the workshop, order material that we need and then describe to them what needs to be done. There are always meetings with clients or architects. There is lots of driving involved between clients and sites, suppliers and galvanizers. I am very hands-on in my business. What do you like the most? Independence, interesting challenges, being creative in order to meet a challenge and the ability to come and go as I please. What don’t you enjoy? Traffic, unreliable workers and tax! What’s been the highlight of your career thus far? I have been involved in some big projects in Cape Town, e.g. Boulevard Park, Virgin Active in Steenberg, The Pepper Club in Loop Street, and the Crystal Towers at Century City. On all of them, I was worried that I was in over my head, but what tools you don’t have you can always hire and you take each day as it comes. I am also lucky enough to have friends who give me good advice and lend me equipment if needed. Your goals for the future? To grow this business to the next level and, as a side-business, to possibly open a restaurant (cooking is my other passion). What advice would you give to someone starting out as a welder? You need little investment, but you do need determination. You need to network and market yourself all the time. Never miss an opportunity to tell someone what you do. You never know what a person may be needing – be it a metal staircase or a beautiful balustrade. Training as a welder can range from a few weeks of study or on-the-job training for low-skilled positions, to several years of combined study and on-the-job training for highly skilled jobs. Welders generally either do an apprenticeship with a company; follow a learnership programme, which combines theoretical study with on-the-job training; or study with an institution, which combines theoretical learning with practical experience. After completing a practical internship under the supervision of an experienced artisan for a specific period of time, graduates are required to write a Trade Test before practicing as a qualified welder.